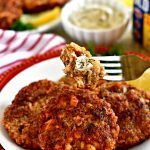 Easy gluten-free salmon cakes that are full of flavor from Old Bay and dill, crispy on the outside with tasty bites of salmon with a creamy dill sauce. Make this dill sauce first. Combine mayonnaise, dill, garlic salt, lemon, and horseradish sauce in a small bowl. Chill in the refrigerator while cooking salmon patties. In a bowl beat the two eggs, add the Old Bay, dill, bread crumbs and relish(optional). Mix until all ingredients are combined. Add the drained canned salmon and mix to combine the ingredients well. Heat vegetable oil in a large pan on medium/high. Form 3-inch patties of salmon cakes 1-inch thick. You should yield 8 cakes. Fry cakes until golden in a single layer 3 or 4 minutes on each side. Place the salmon patties on a parchment lined (or use cooking spray) baking sheet. Bake the salmon cakes for 10 minutes at 375° F. Make sure you turn them over after 5 minutes of baking so both sides will be golden brown. Dill sauce modified from Taste of Home.